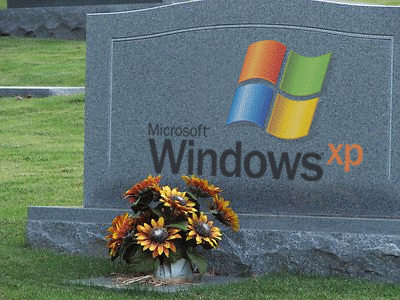 Microsoft kills Windows XP – so now what? April 9th, 2014 – a day that will live in computer infamy. Windows XP was unleashed on the market on August 21st, 2001, and it’s an example of an operating system that may have been made a bit too well. Normally, versions of Windows become so outdated and frustrating that people mob stores when a new version is released. This never really happened with XP. People just kept using it, Microsoft kept updating it, and it seemed to work well enough for everyone. If it works, why change? The problem is not with Windows, it’s with the Internet. We’re all using the web in ways that weren’t even imagined in 2001, and you can only patch and upgrade something so many times before you end up with a big mess. XP is an example of that. 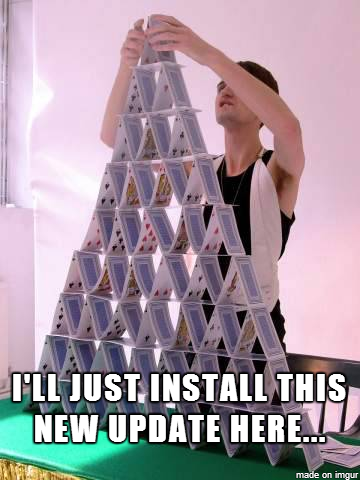 It has so many patches and workarounds built-in to get it to work with the modern Internet that the insides look a lot like a house of cards…you get to a point where you begin needing patches for the patches you installed. I Can’t Change! What Can I Do? We get it. Maybe a new computer isn’t in your future right now. Maybe you need to get a lot of information off of your old system before getting a new one. Maybe your company built its entire infrastructure around Windows XP and it would cost millions of dollars to change. There are lots of reasons people simply can’t give up the ol’ girl. If this describes you, you’re in luck. While it’s still recommended you at least make a plan to get off of your beloved 12+ year old operating system, there are some things you can do to keep it running and reasonably safe in the near-term. Internet Explorer 8 is the last version of IE available for Windows XP. It came out in 2009 and it really shows its age. You need to stop using it. Like…really stop using it. IE8 doesn’t support a lot of features on modern web pages (a lot of email and banking systems will tell you to upgrade immediately if you log into them with IE8). Therefore, websites you visit may not be fully functional, and since it’s not going receive security updates anymore your information or identity could end up at risk. Fortunately there are more modern replacements for Internet Explorer that DO still work on Windows XP. Google Chrome is a very popular web browser alternative that is both light-weight (meaning it runs pretty well on older PCs), and has a lot of neat integration features that make using Google-based services like Gmail, YouTube, and Google+ easier. Chrome also features a sync feature that allows you to sign in to the browser and synchronize all of your bookmarks, history, saved passwords, and more on multiple devices. This allows you to keep your own personal setup no matter where you’re accessing the Internet. Chrome is completely self-contained, so it will continue to receive updates and allow all web content to work correctly and securely. Firefox is another option if Chrome doesn’t fit your needs. Firefox more closely resembles Internet Explorer, and is popular with the tech-savvy crowd due to its customization features. It is larger than Chrome however, so performance on older PCs might take a hit. Microsoft Security Essentials became very popular with the Windows XP crowd. This free security software from Microsoft gave users basic virus and malware protection, with the added benefit of being updated automatically through the Windows Update service. Alas, MSE is R.I.P. for XP. MSE will no longer be updated, and antivirus software that isn’t updated is basically useless. You’ll want to uninstall and replace it with something that is continuing XP support. AVG is currently keeping XP support, and they offer free as well and paid versions of their service. Another company, Avira, is offering the same deal. Businesses that are holding on to XP workstations that need some extra protection can look to TOAST.net’s GFI Managed Antivirus, which should continue support for at least 1 year (probably more). XP users are seeing warning prompts here and there already. Things like “Windows XP Support Has Expired” or “You Are No Longer Receiving Updates” might flash on your screen from time to time. While this can get annoying, it doesn’t really affect anything…yet.